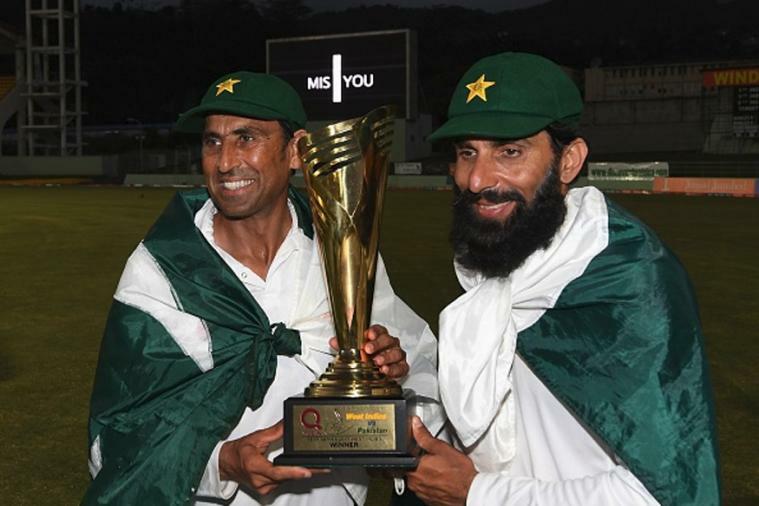 Roseau, Dominica: Pakistan won a thrilling third and final Test with six balls to spare to clinch a first series victory in the West Indies Sunday and give a fitting farewell to the retiring captain Misbah ul Haq and veteran Younis Khan. Roston Chase's unbeaten 101, his second hundred of the series, proved in vain as the home side, set a target of 303 at Windsor Park in Dominica, slipped to 93 for six before the lower order almost rescued a dramatic draw. "This was just incredible," said a breathless Misbah after Shannon Gabriel dragged a wide delivery from Yasir Shah onto his stumps with just six balls left in the game to trigger Pakistani celebrations as the West Indies were dismissed for 202 to lose the series 2-1. "There were so many things happening in that last session –- dropped catches, appeals, no-ball dismissals –- it looked for a while as if it wasn't going to happen. "I am thankful for myself, the team and all supporters of Pakistan cricket that we were able to pull it off." Chase, who also top scored in the first innings with 69 and earned the man-of-the-match award, was the prime beneficiary of those near-misses. Twice he saw caught-and-bowled attempts by Hasan Ali put down and then was reprieved on 91 when an edge to Asad Shafiq at slip off Mohammad Abbas was shown to be off a no-ball. "I'm really disappointed that we couldn't hold on for just one more over," said a crestfallen Chase. "We have showed that we can compete with the best but it’s up to us to be able to take it all the way. It doesn’t even matter that I got a hundred." In the end he completed his third Test century but was left helpless at the non-striker's end when Gabriel, who had defended resolutely for 21 balls, inexplicably attempted a wild drive off Shah and dragged the ball back onto his stumps. Shah finished with five for 92 and a series haul of 25 wickets, the highest of his career, as he took the man of the series award. From their mid-afternoon perils, a 58-run seventh-wicket partnership between Chase and Jason Holder frustrated Pakistan for an hour-and-a-half, until the West Indies captain missed a knee-high full toss from Hasan Ali to be leg before for 22 just after tea. Devendra Bishoo and Alzarri Joseph also offered some resistance but it was Gabriel's defiance through eight nerve-jangling overs with Chase that almost took the West Indies to safety and a drawn series. A swift end to the match had looked likely as Vishaul Singh and Shane Dowrich both fell to Shah just after lunch. Both were taken at short-leg by Babar Azam and on a pitch offering turn and bounce, it appeared only a matter of time before more wickets fell. But Chase and Holder batted with calm assurance as the Pakistanis grew increasingly impatient in pursuit of the breakthrough. Such anxieties appeared unlikely at the start of the day. Having already lost the wicket of Kieran Powell overnight, the home side suffered two further setbacks inside the first hour of the morning. Kraigg Brathwaite’s poor run of form continued when the opening batsman miscued an attempted cut off Shah for Hasan Ali to take the comfortable catch at backward point. Shimron Hetmyer batted positively for 25 but was then comprehensively bowled by Mohammad Amir for the third time in the series. Chase then joined Shai Hope with the pair defying all the challenges presented to them by the Pakistani attack until Hasan Ali got the breakthrough and his first Test wicket 20 minutes before lunch, trapping Hope leg-before with a full-length inswinger. His two additional wickets in that pulsating final session were critical to the victory.